First up, we have this otherworldly set by Anna’s Creation. This is a huge set with 152 watercolored clip arts, 6 seamless patterns and a few ocean themed digital papers. 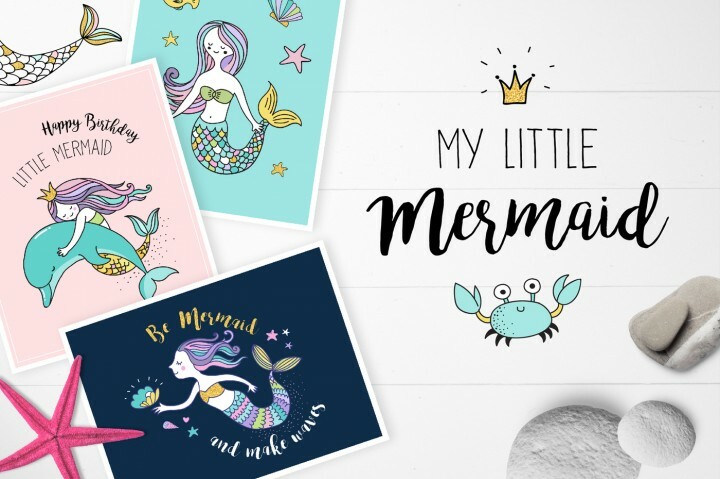 There are also a few pre-made mermaid compositions with quotes included to save time when designing, as well as floral wreaths and fun glitter, gold elements. 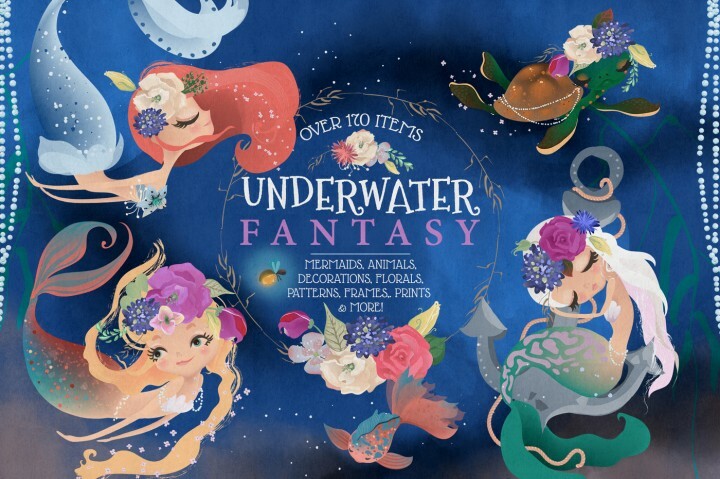 This set will definitely make you feel like you’ve discovered a magical world of mermaids. This fun children storybook like illustration set is designed by MizzLisa. With funky illustrations like a cute flamingo on a diving trip, this set is a must have as it is so unique. This illustrations in this set come in colored and outlined versions, allowing the freedom to personalize the designs further. Mermaid set with unicorn colors? Count us in for sure. This little set has 32 elements, 8 cards, 2 posters and 8 seamless patterns that come in different formats. This design of Marish is great for design on t-shirts, bags, cards, banners, you name it. Here’s a gorgeous blue and purple mystical watercolored mermaid set, hand painted by Cornercroft. This set contains 21 individual watercolored graphic elements and 3 watercolored backgrounds. The mermaids and sea creatures would look amazing as wall decor. Glitter mermaids are the prettiest. 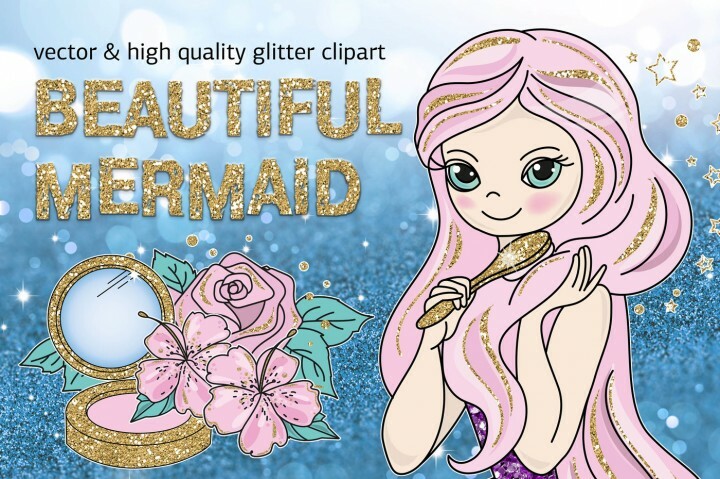 This high quality glitter clip art set by Faraway Kingdom has all the sparkle you need in your ocean themed projects. They all come in PNG format, so easy design work with no pressure. Are your friends obsessed with mermaids too? 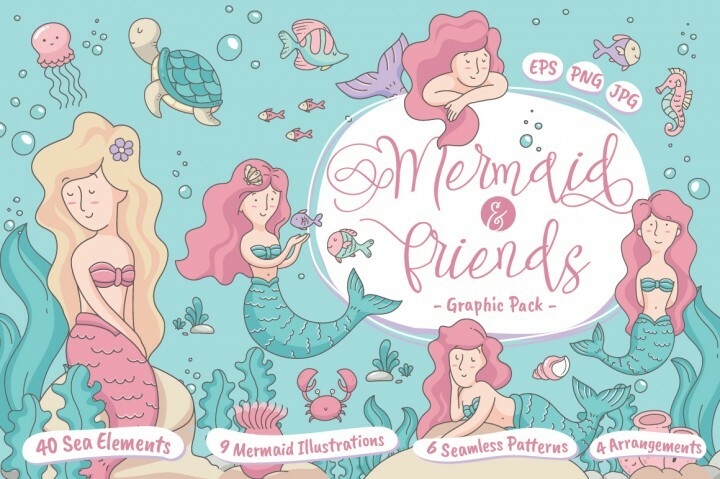 You can all enjoy this Mermaid Friends set by Shark&Croc Co. With 9 pretty pastel coloured mermaids and extra 40 cute sea elements, this set is to swim for! Definitely not to be missed. If the previous glitter set wasn’t enough, this cute baby mermaid set is less than $4! There are also additional nautical themed clip arts like seashells and seaweed for your designs. High quality, and affordable set by DillyPeach Designs. 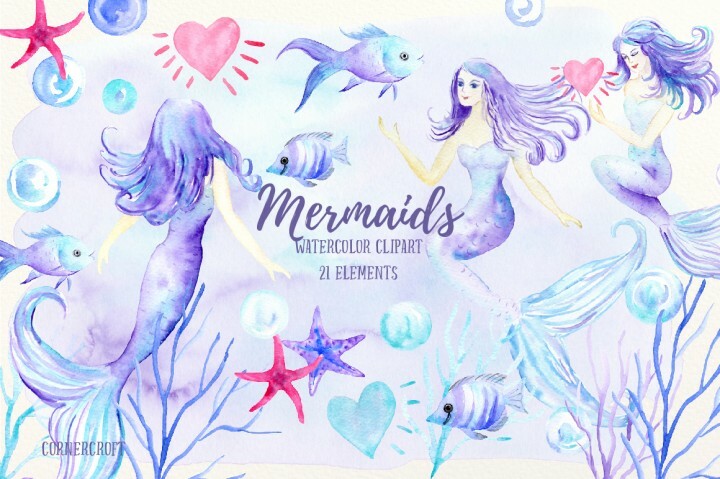 A detailed gorgeous watercolor mermaid set by Whimseez to fulfill your whimsical fantasies of mermaid life. If we had an idea of teenage mermaids, this is what they would look like. 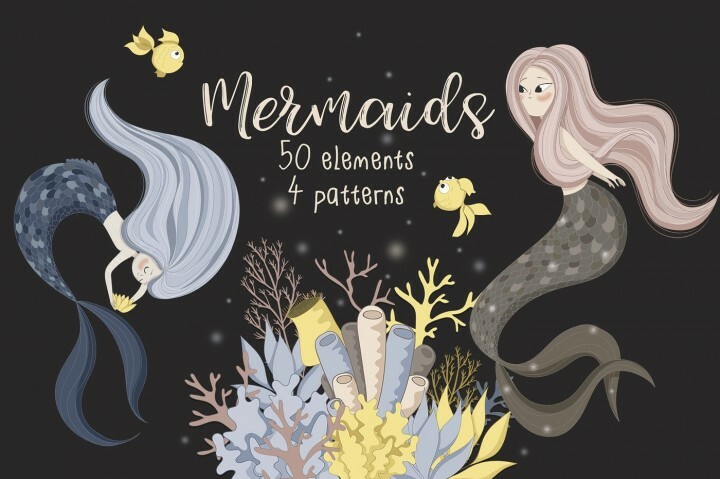 This amazing graphic set is another mermaid set by Anna’s Creation. You can find more than 170 graphics to mix and match in this set, and have lots of fun decoration the mermaids hair with flowers. 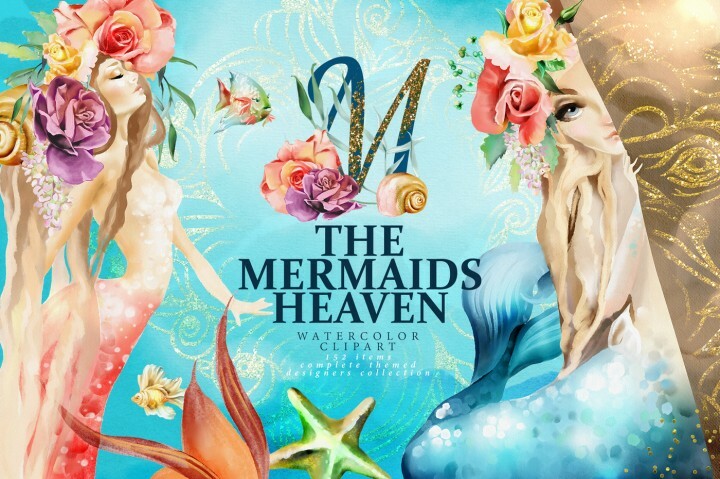 The design on the mermaid tails are also super pretty. This set by Anastasy_helter is very different from the rest, as it carries a vintage vibe. You can find more than 70 hand drawn illustrations and elements. Also included, 21 coloured backgrounds, 12 landscapes, 16 marine patterns as well as 24 summer typography quotes! 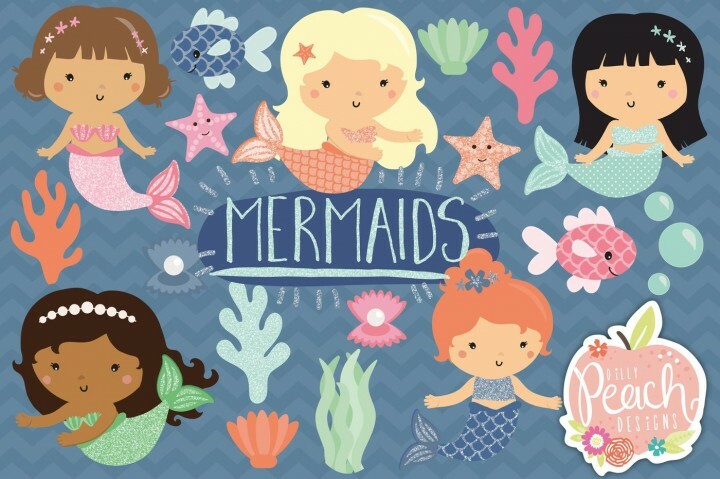 A fun little set that is great for children who love mermaids. Hand drawn by Wallifyer Clipart , this set contains 12 clip art elements in PNG and JPEG format. Great for simple mermaid decor. This set by Natdzho is cute but mysterious looking. It contains 50 high quality illustrations, with 4 seamless patterns. Includes super cute sea life creatures and plants inside. 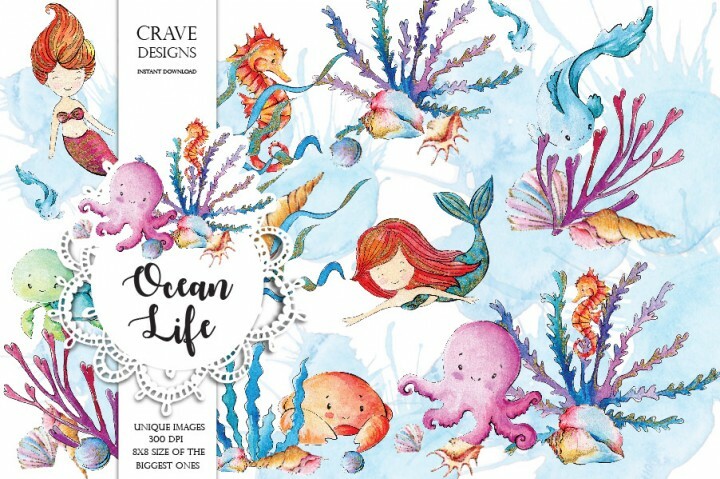 Ocean Life Clip Art is a colorful, fun and cute set, hand painted by Crave Designs. 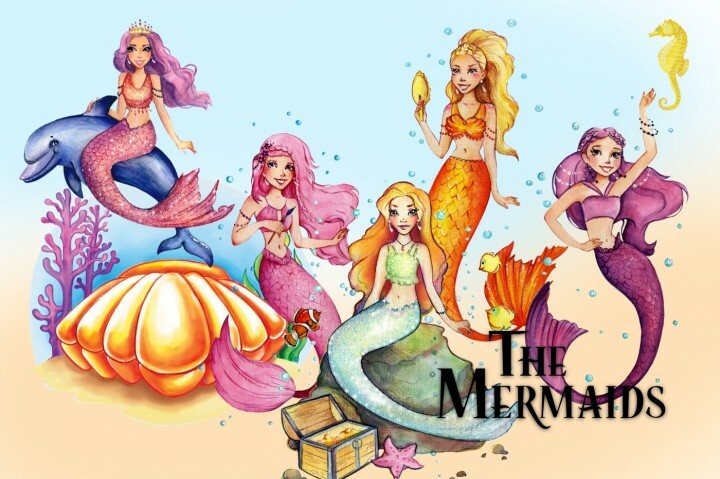 The mermaids are accompanied with adorable sea creatures like those seen in the image above. Great for designing for kids as well. 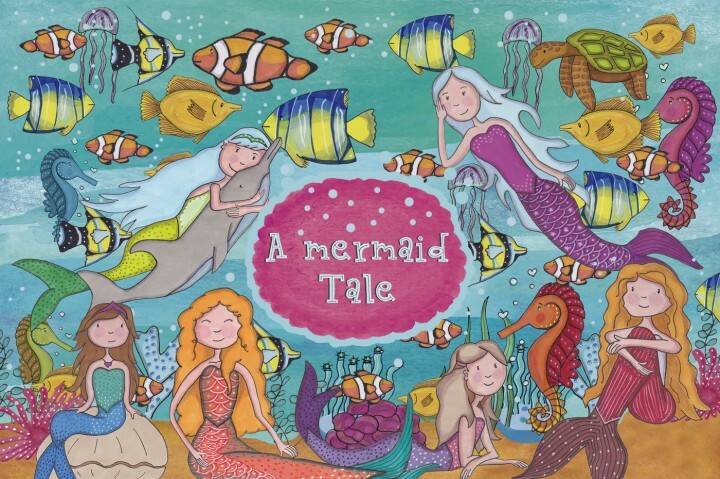 This mermaid graphics set would complement a children’s storybook really well. 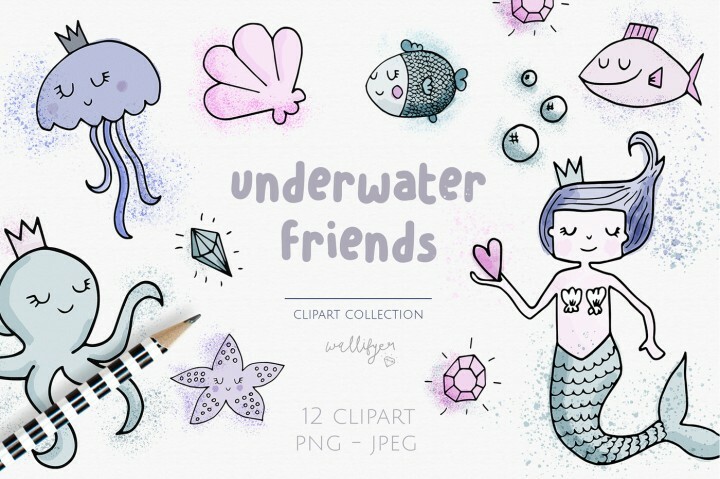 Made by Cute Little Workshop, this clip art set contains 6 mermaids, and a bunch of other sea creatures. Could also be used for clothing prints, birthday cake toppers, and themed events. 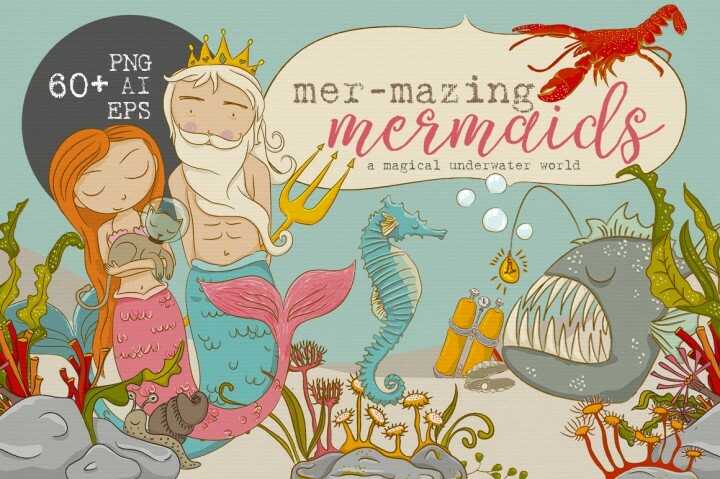 That concludes our handpicked collection of mermaid graphics from our site. 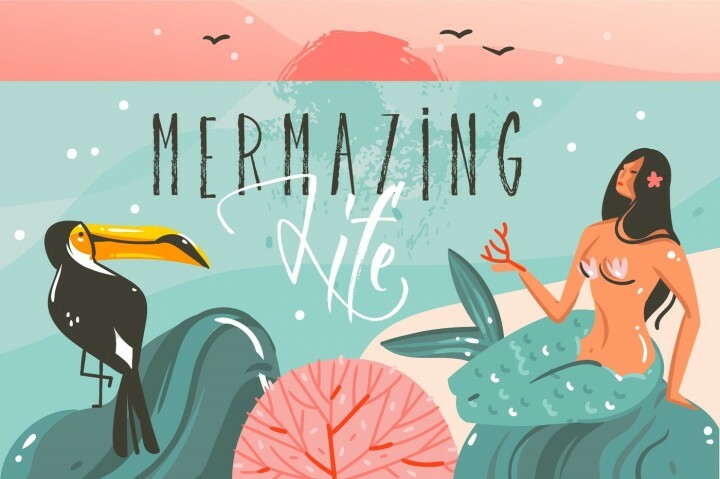 Of course, there are so many more, but if we go on, it might never end 😀 For more of these mermaid graphics, click here. Do check out our latest post on Funky Display Fonts too! Unless you’re looking for more graphics, then head on over to this post on $1 Graphics.